The flamenco show ended in tears. It had begun well enough, with the performers taking their places on stage, smiling and nodding at each other. The guitarist was off to one side. The male singers were in a line of chairs in the back with the dancers seated in front of them. We were at Cardomomo in Madrid, Spain, with our guide, Luke, from Devour Madrid. Before the show, Luke had taken us through the Literary Quarter, stopping at a couple of tapas bars, where he explained tapas culture, Spanish wine, and the basics of flamenco. Flamenco is a passionate, emotional performance art that combines singing, dancing, and instrumental accompaniment. It is thought to have originated with the Roma people from India. 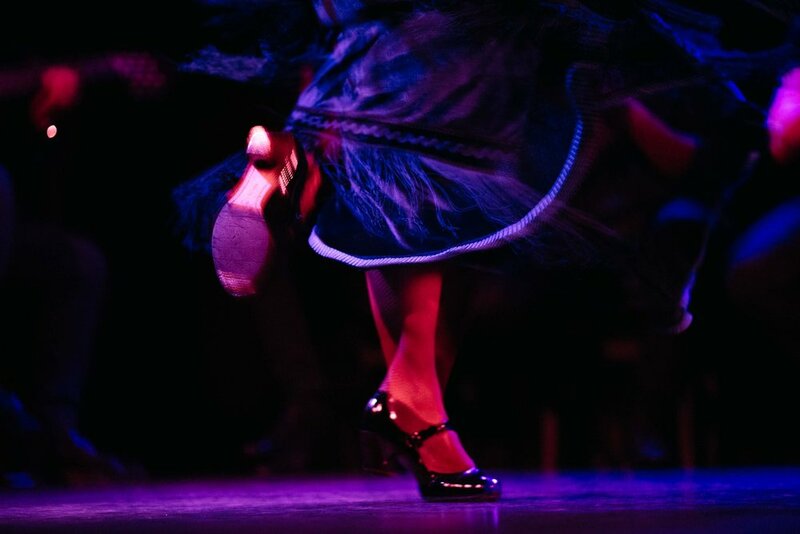 Centuries of mingling between Moors, Jews, and Christians in Spain changed the music and dancing into the flamenco that is now a part of the Gypsy culture of the Andalusia region. At Cardomomo, the guitarist warmed up while the other performers chatted with each other, their voices rising until one began singing. Occasionally, participants called out "ole" to acknowledge and encourage each other. The guitar was ever-present but unobtrusive. The dancers provided percussion with complicated claps and snaps. The audience members were voyeurs prying into the secret language - words, looks, gestures - that only the performers seemed to understand. The oldest gentleman sang in a throaty, guttural voice common to traditional flamenco. The youngest gentleman sang in a clean, clear voice. The dancer slowly built the tempo with her hands and feet. Soon, the stomps of the dancer's feet consumed the stage. The tempo quickened to an impossible pace, the volume rose, the sweat flew. Expressions fluttered on the dancer's face like the shadows of a tree changing on a windy day. Just when it seemed too excruciating to bear, the performance climaxed with a sudden stop. The audience's voyeuristic spell dissolved into wild applause. Then a baby broke out crying. "Who brings a baby to a 10 pm flamenco show?" I thought to myself. The baby continued crying as the next performance began. The singer turned in the baby's direction, to send a scolding or consoling message to the parents; I'm not sure which. The baby responded by quieting down, and the show went on. “Even the baby responds to the power of the flamenco performers,” I thought. Several performances followed, with various combinations of singers, dancers, and styles. Each time, informal chatter transitioned to singing and a dancer rose, leading the crescendo of the 12-part rhythm. The female dancer moved her arms, hands, and torso fluidly and used her costume - an intricate skirt or a delicate shawl - as a prop. The male dancer focused on his feet and legs, all power and speed. A violinist joined the last two performances. Luke told us a violinist is a rare treat. That’s also when the tears started; not the musicians', not the singers', not the dancers', but mine. Perhaps it was jet lag from our overnight trip from Boston to Madrid. Perhaps it was the realization we were finally starting our long-awaited trip to Spain. I like to think it was the profound emotion on the dancers' faces and the passionate vocals. And the violin’s long, gentle sound streaming through the room. Melissa Paquette is a native Mainer who makes a living as a technical writer in the Boston area. To fulfill her creative side, she writes about her travels in, around, and nowhere near Boston. You can read about her latest adventures and musings on www.peregrinecall.com.